In this tutorial, I'll show you how to whiten teeth in Photoshop using a Hue/Saturation adjustment layer which lets us both whiten and brighten teeth at the same time. We'll start by learning how to whiten teeth for a single person in an image, and then we'll learn how to whiten the teeth for two or more people in the same photo using separate adjustment layers. I'll be using Photoshop CC but everything is fully compatible with Photoshop CS6. Both people's teeth could be whiter and brighter. Watch the video tutorial on our YouTube channel! If you're working on a photo with two or more people in it, as I am here, you may be tempted to select and whiten everyone's teeth at once. But the problem is, everyone's teeth are different and usually need different amounts of whitening. You'll get better results by whitening one person's teeth at a time. I'll start with the man on the left. Drawing a selection outline around the teeth with the Lasso Tool. The adjustment is added above the image. The Edit option is set to Master by default. 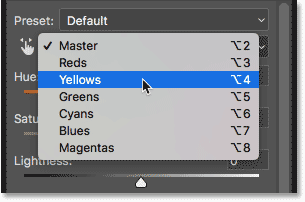 Changing the Edit option from Master to Yellows. 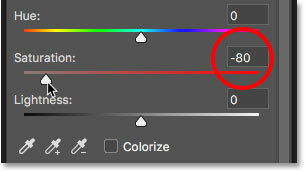 Dragging the Saturation slider to -100. Grayish-white is not a healthy look for teeth. Dialing back the Saturation value. 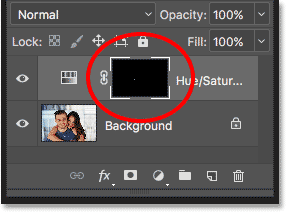 Toggling the adjustment layer on and off with the visibility icon. A before (left) and after (right) comparison of the teeth whitening. Setting Edit back to Master. Increasing Lightness to brighten the teeth. 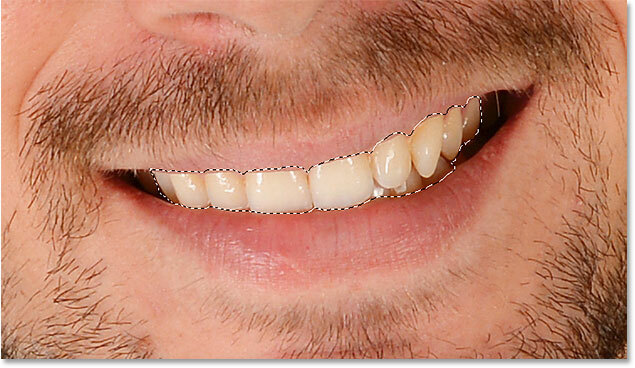 The teeth have been brightened, but so have areas around the teeth. 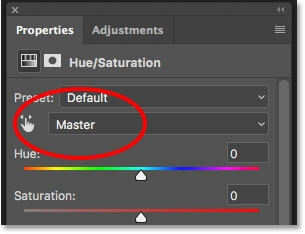 The layer mask thumbnail for the Hue/Saturation adjustment layer. The Foreground color (upper left) should be set to black. 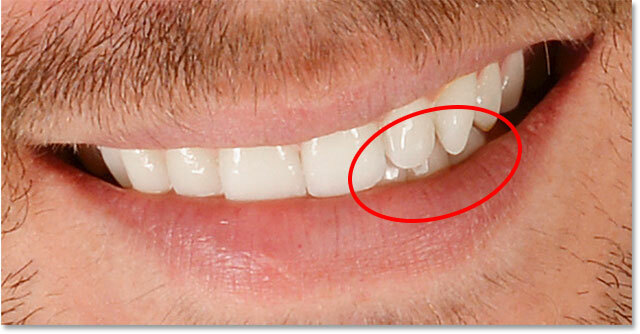 Paint around the teeth to clean up any problem areas. A small, soft-edge brush will work best. You can adjust the size of your brush from the keyboard. Press the left bracket key ( [ ) repeatedly to make the brush smaller or the right bracket key ( ] ) to make it larger. To make the brush softer, press and hold Shift while pressing the left bracket key, or hold Shift and press the right bracket key to make the brush edges harder. Cleaning up the areas above the teeth. Cleaning up the areas below the teeth. If you make a mistake and accidentally paint over the teeth, press the letter X on your keyboard to swap your Foreground and Background colors. This sets your brush color to white. Paint over the mistake to bring back the whitening, and then press X again to set your brush color back to black and continue painting. The result after cleaning up the surrounding areas. A few of the teeth are looking unnaturally light. Painting over those three teeth to bring back some of the original shadows. The result after whitening and brightening the man's teeth. 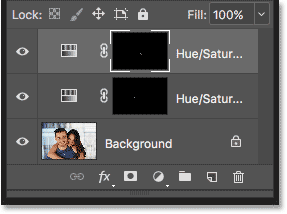 As I mentioned earlier, for best results when whitening teeth for two or more people in the same photo, you'll want to use a separate Hue/Saturation adjustment layer for each person. We've already gone through the details of each step when I corrected the man's teeth, so I'll go through them again quickly here with the woman's teeth just so we can see how to work with multiple adjustment layers in Photoshop. Selecting the woman's teeth with the Lasso Tool. 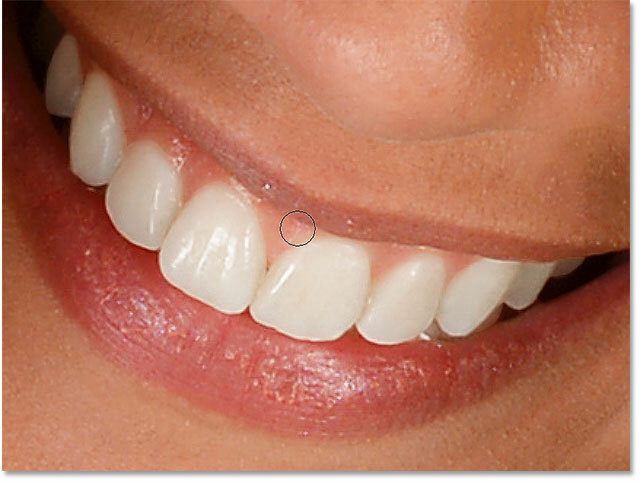 Adding a separate Hue/Saturation adjustment layer for the woman's teeth. The second adjustment layer appears above the first one. The woman's teeth need less whitening than the man's. Adding just a hint of brightening with the Lightness slider. Cleaning up the areas around the teeth by painting with black on the layer mask. 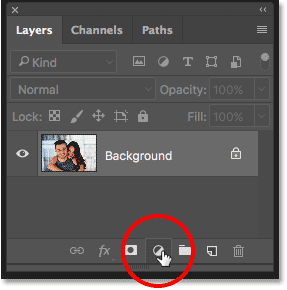 Clicking the Background layer's visibility icon while pressing Alt (Win) / Option (Mac). Viewing the original image for comparison. 01. 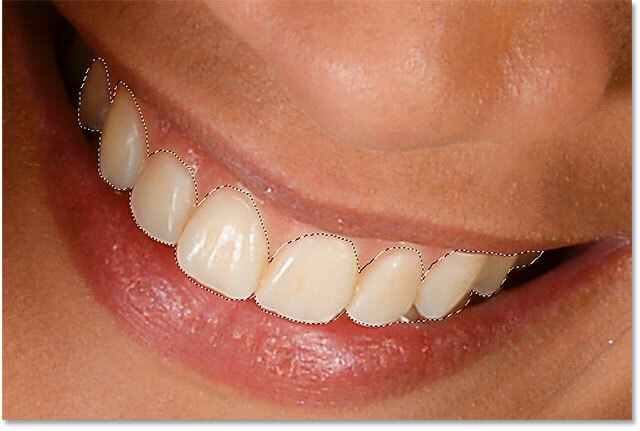 First, select the Lasso Tool and draw a selection around the teeth. 02. 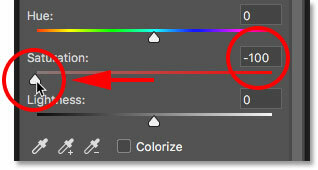 In the Layers panel, click the New Fill or Adjustment Layer icon and choose a Hue/Saturation adjustment layer. 03. 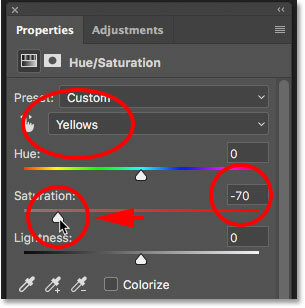 In the Properties panel, change the Edit option from Master to Yellows. 04. Drag the Saturation slider to the left to reduce the yellow in the teeth. 05. 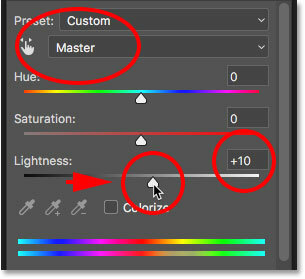 Still in the Properties panel, change the Edit option from Yellows back to Master. 06. Select the Brush Tool, set your Foreground color to black, then paint around the teeth on the layer mask to hide the effects of the adjustment layer in the lips and gums. 07. For images with two or more people, use a separate Hue/Saturation adjustment layer for each person for best results. And there we have it! 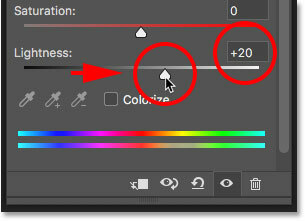 That's how to easily whiten and brighten teeth using a simple Hue/Saturation adjustment layer in Photoshop! Visit our Photo Retouching section for more image editing tutorials!